When the first production licences were awarded in the mid-1960s, hardly anyone realised what a huge impact the industry would have on the Norwegian economy. Fifty years later, it is more important than ever. Norway’s petroleum era started more than 50 years ago, and a number of the early fields are still producing. The first fields to be developed were in the North Sea, and the industry has gradually expanded northwards into the Norwegian Sea and the Barents Sea. At the end of the 1950s, very few people believed that there were rich oil and gas deposits to be discovered on the Norwegian continental shelf. The Geological Survey of Norway even wrote to the Ministry of Foreign Affairs in 1958 stating that the possibility of finding coal, oil or sulphur on the continental shelf off the Norwegian coast could be discounted. But the discovery of the Groningen gas field in the Netherlands in 1959 opened people’s eyes to the prospect that there could be hydrocarbons under the North Sea. In October 1962, Phillips Petroleum sent an application to the Norwegian authorities requesting permission for exploration activities in the North Sea. The company asked for a licence for the parts of the North Sea that were in Norwegian territorial waters and that were or might be designated as part of the Norwegian continental shelf, and offered USD 160 000 per month. This was regarded as an attempt by the company to obtain exclusive rights. The authorities decided that it was out of the question to hand over the entire continental shelf to one company. If these areas were to be opened for exploration, more companies would need to be involved. Each of the sea areas are divided into quadrants measuring one degree of longitude by one degree of latitude. The quadrants in the North Sea are numbered from 1 to 36, while those in the Norwegian Sea and Barents Sea are numbered by longitude and latitude. Each quadrant is further divided into 12 blocks. In May 1963, the Norwegian Government proclaimed sovereignty over the Norwegian continental shelf. A new act was adopted establishing that any natural resources on the shelf belong to the Norwegian state, and that only the King (in practice the Government) has the authority to award licences for exploration and production. Despite Norway’s proclamation of sovereignty over large sea areas, it was still necessary to clarify the delimitation of continental shelf, and primarily the boundaries with Denmark and the UK. In March 1965, agreements were concluded on the delimitation of the continental shelf on the basis of the median line principle. 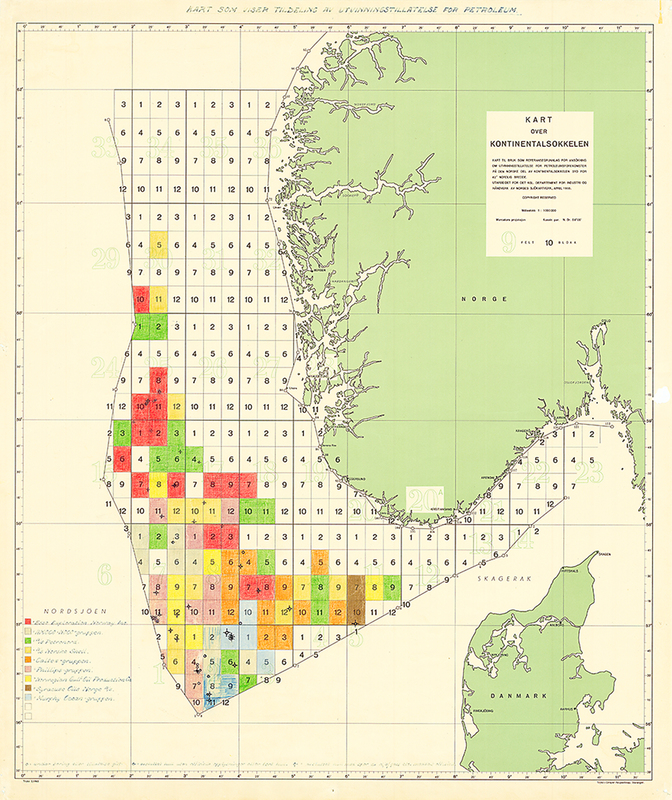 Norway’s first licensing round was announced on 13 April 1965, and 22 production licences were awarded, covering 78 geographically delimited areas (blocks). The licences granted an exclusive right to explore, drill and extract oil and gas in the areas to which they applied. 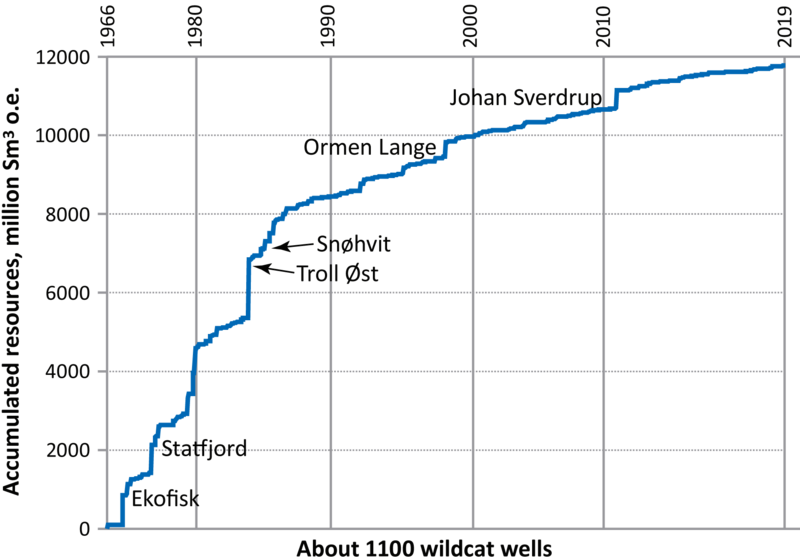 The first exploration well was drilled in summer 1966, but proved to be dry. 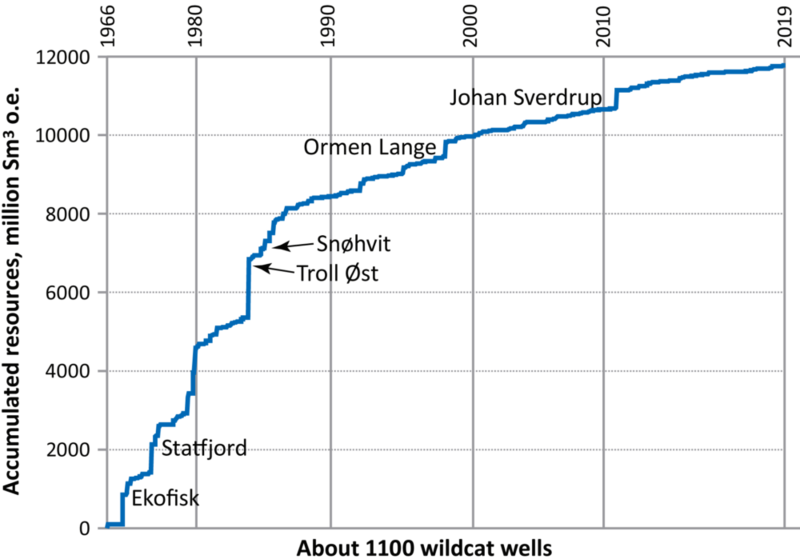 The first oil discovery on the Norwegian shelf was Balder in 1967. However, it was not considered to be economically viable at the time, and it took another 30 years before the field was finally developed. Just before Christmas in 1969, Phillips informed the Norwegian authorities of the discovery of Ekofisk, which turned out to be one of the largest offshore oil fields ever discovered. This was when Norway’s success story started in earnest. Production from the field started on 15 June 1971. A series of major discoveries was made in the next few years. In the 1970s, exploration activity was concentrated in the areas south of 62°N (Stad). The continental shelf was opened gradually, and only limited numbers of blocks were announced in each licensing round. The most promising areas were explored first. This led to world-class discoveries, and production from the Norwegian continental shelf has been dominated by large fields such as Ekofisk, Statfjord, Oseberg, Gullfaks and Troll. 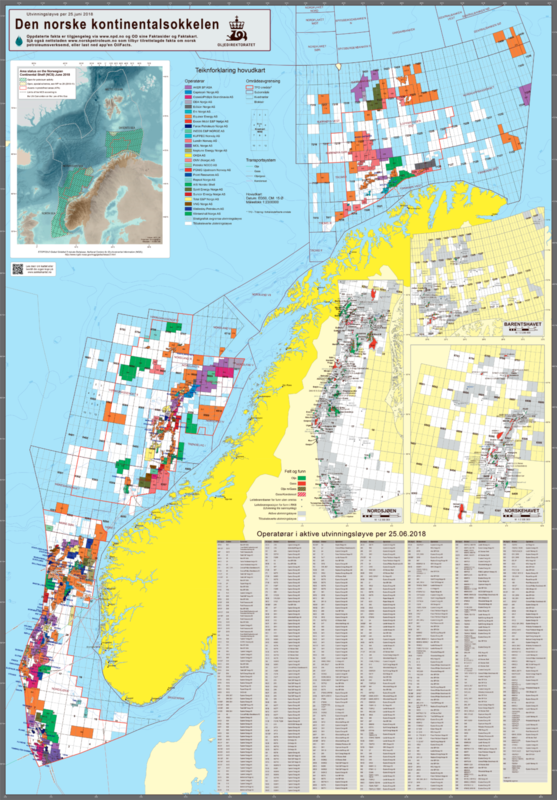 These fields are still very important for the development of Norway’s petroleum industry. It has also been possible to tie in a number of other fields to the infrastructure established for the major fields. Production from several of the largest fields is now declining, and a number of new, smaller fields have been developed. As a result, petroleum production is now split between a larger number of fields than before. In 1979, the area north of 62°N was also opened for petroleum activities. Exploration in parts of the Norwegian Sea and Barents Sea began early in the 1980s, and was later expanded to new areas as they were opened. In 1993, production began in the Norwegian Sea, and in 2007 it was the turn of the Barents Sea. In the early days, foreign companies dominated exploration activities, and they were responsible for developing the first oil and gas fields. Norwegian participation gradually increased as Norsk Hydro became involved. Saga Petroleum, a private Norwegian company, was established in 1972. 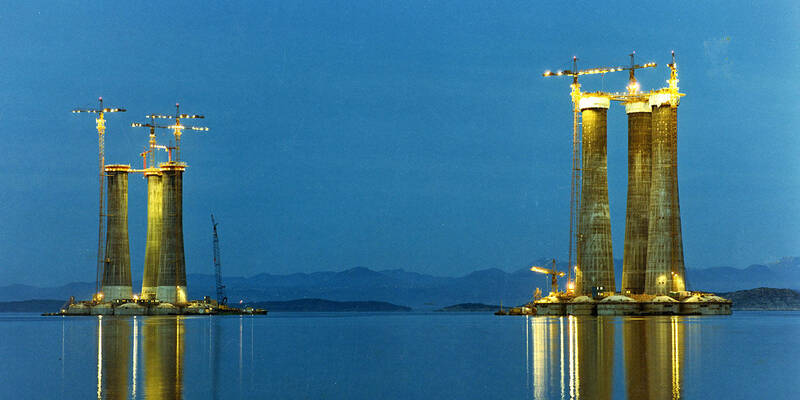 Statoil (now Equinor) was also established in 1972, with the Norwegian state as sole owner. Norway also established the principle that the state was to have a 50 per cent ownership interest in every production licence. From 1 January 1985, this system was reorganised. The Norwegian state’s participating interest was split in two: one part linked to Statoil and one to the State’s Direct Financial Interest (SDFI) in the petroleum industry. The SDFI system means that the Norwegian state owns holdings in a number of oil and gas fields, pipelines and onshore facilities. The proportion is determined when production licences are awarded, and varies from field to field. As one of several owners, the State covers its share of investments and costs, and receives a corresponding share of the income from production licences. 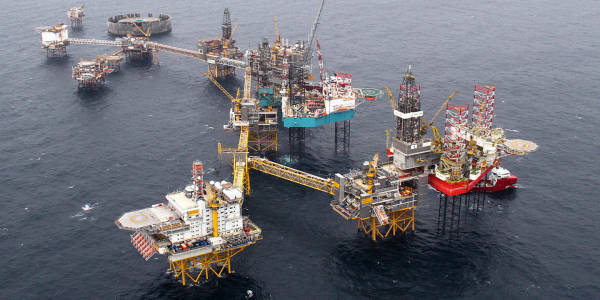 Statoil was made responsible for handling the commercial aspects of SDFI on behalf of the state. In spring 2001, the Storting (Parliament) decided that 21.5 % of the value of the SDFI portfolio could be sold; 15 % was sold to Statoil and 6.5 % to other licensees. The sale of part of the SDFI portfolio to Statoil was seen as an important element in the successful part-privatisation of the company. Statoil was listed on the stock exchange in June the same year, and now operates in the same way as any other commercial actor on the Norwegian continental shelf. The state-owned enterprise Petoro was established in May 2001 to manage the SDFI on behalf of the state. In 2007, Statoil merged with Norsk Hydro’s oil and gas division. In 2018, Statoil changed its company name to Equinor. At the beginning of this century, the Norwegian shelf was opened up to more types of companies as a way of ensuring sound resource management. The large international oil companies that were already established on the shelf were joined by other types of companies that could see different kinds of commercial opportunities in Norway’s petroleum resources. Today, there is a great deal of diversity and competition on the Norwegian shelf, and more than 40 Norwegian and foreign companies are active. Petroleum activities have played a key role in the development of today’s welfare state in Norway. When the first production licences were awarded in the mid-1960s, hardly anyone realised what a huge impact the industry would have on the Norwegian economy. Fifty years later, it is more important than ever. Figures for the petroleum industry’s share of total value creation, investments, exports and revenues over the years show this very clearly. Activity on the Norwegian shelf will continue to be vital to the Norwegian economy in the years ahead: there are large remaining resources, and major new projects such as the development of Johan Sverdrup are under way.